This is a fictional case - but illegal moves happen each minute of the day somewhere in the world, with similar consequences. After the move 1...h2 White completes the illegal move 2.Nf6 with a clock press (it is his second illegal move). It could be a Standard, Rapid or Blitz game. The arbiter is called by Black who claims White made an illegal move, and the arbiter discovers that Black's flag has fallen. What should the arbiter decide? Last edited by Jesper Norgaard; 08-09-2018 at 10:23 PM. Chess well played is imagination, calculation, observation, experience and memorization in order of importance. 1. Is touching a piece capable of changing the interpretation of "the position is such that the opponent cannot checkmate the player’s king by any possible series of legal moves"? I would say no. After white touches the knight any legal move with the knight produces stalemate, but the wording is "the position is such", and a touchmove constraint is not part of a position. If FIDE had meant it to be so, they could have said so. 2. What happens if a player claims a win by illegal move, then it is noticed their flag is down? As the current Laws are unclear on this I would rule that since the valid claim was made before flagfall was noticed by the arbiter or claimed by the opponent, the valid claim has priority. Based on the combined answers I would award the game to black by virtue of white's illegal move. Though if the players both clearly wanted to call the game a draw I would accept that. It may seem silly that a player can lose by illegal move when they have touched a piece with which every legal move draws. But it is possible in theory that the player mistakenly thought the illegal move would win, and that had they been aware it was illegal, then they would have instead played a worse move with a different piece. Yes that is pretty far-fetched in this position, but there could be a position with the same characteristics in which it was more plausible. Players who break the rules shouldn't get any benefit of the doubt that isn't crystal-clear in the Laws. Last edited by Kevin Bonham; 08-09-2018 at 11:06 PM. I pretty much agree with all you say. That touch-move is not part of a position, and should not be included in "any possible series of legal move", is very clear from 3.10.1. FIDE once issued useful interpretations of the laws (around 1974-76). Then they stopped because they became de facto rules that were difficult to handle together with the official rules. I think FIDE is beginning to understand that there is still a need for something of that nature, and Takis Nikolopoulos has issued a set of ten points which he wanted to emphasize, for instance that to capture the opponent's king is indeed and illegal move (despite 3.10.2 and also based on 1.4.1). I can now only find the text in http://www.chesschat.org/showthread....l=1#post426681 and no longer in the FIDE website. The Arbiter's Manual which contains interpretations interspersed in the Laws of Chess, is another example. However in none of these I have been able to find an official interpretation of how "any series of legal moves" should be handled concerning touch-move rules. It would be nice to have an official and authoritative interpretation, for instance in the FIDE website. A good place would probably be the Arbiters' Manual 2019 or whenever it is due. If anyone knows any other source of such an interpretation, please inform us! I'm liking the look of 7.5.1 and 7.5.5. It would seem here that touch move would be enforced here, and the game would result in a draw whether the illegal move resulted in a 'forfeit' of White or whether the position was restored and time added (or deducted). To be honest it should be considered a part of the position. That is how I read it, whether it's official or not. Different arbiters may interpret differently. I also put this to you - assume instead that this was White's first illegal move. I assume you would add time to Black's clock to continue. Would you require him to move the touched piece given 12.1? If you would enforce it during this scenario it should also be applied to the second infringement - White would have been forced to move the knight, therefore stalemate stands. There are many arbiters that would agree with you, but I don't agree. I think you can only reach such a conclusion by ignoring that legal moves are only defined in 3.10.1, it doesn't mean "legal according to all the Laws of Chess". I was surprised how many arbiters support your view, therefore I think FIDE needs to clarify the issue, if not by making clearer laws, then by issuing an authoritative interpretation of the laws with this case or similar cases. I do agree with you that if this was the first illegal move, 4.3.1 means that White is forced to play 2.Ng6 or 2.Nf7. Of course also one or two minutes should be added to Black's clock depending on the mode of play. It is of course not very necessary, because now the game will be stalemate. Only in the second scenario do we enter the following of 7.5.5: "; for the second completed illegal move by the same player the arbiter shall declare the game lost by this player. However, the game is drawn if the position is such that the opponent cannot checkmate the player's king by any possible series of legal moves." And even though White would be forced to play 2.Nf7 or 2.Ng6 if the game were to continue, when only legal moves are considered, then 2.Ke1 is legal, and after 2...Kg2 and 3...h1Q Black will quickly be able to checkmate. So Black wins based on the second illegal move. I would disagree here. Illegal moves and not moving the touched piece are both infringements, so I'm sure most people could be forgiven for thinking the 'what if' scenario of what result would happen if the game was allowed to continue. A lot of rules and consequences could easily be interpreted as such - for instance the any sequence of legal moves is basically 'if the game continued technically I could still checkmate'. Like I said people will agree and disagree with just about anything that's not clear - and that's the underlying problem. Not everything is clear, and rightly so - some situations are so ridiculous that they simply not occur without great imagination on people's parts. On a parting note for the night - is Ke2 not infringing on a rule, therefore not technically legally playable? It seems to me that the Rules Commission did not think so. Each year new arbiters get appointed, and they stumble on the same holistic views as you. I don't really care how this is interpreted. But it's definitely not good that 50% of the arbiters will interpret one thing, and the other 50% something else. That needs to stop. Confusion is understandable because given the position and facts, playing a move which fully conforms with the Laws of Chess will result in Stalemate, so it's an easy decision to justify. Exactly. FIDE has tweaked the meaning of the words in the Laws of Chess, something that "fully conforms with the laws" is what we normally understand to be "legal" (in daily life). FIDE has made a different and more restricted definition for chess. I don't know if a crystal clear interpretation of similar situations will actually solve the problem. Ignoring the reference to section 3.10 this could be misread as saying that once a piece that has a legal move has been touched, moving another piece instead of that one is an "illegal move", which would make Ke2 both legal under 3.10.1 and illegal according to the glossary. Another point: of course if Nf6 is the first illegal move then touchmove applies per 7.5.1 " Articles 4.3 and 4.7 apply to the move replacing the illegal move." But when it comes to a second illegal move, one does not generally reinstate the position (because one just declares the game lost), one does not continue the game from the last identifiable position (ditto), so why attempt to apply the touchmove rule to the hypothetical case in which it continues? However, the game is drawn if the last identifiable position prior to the second illegal move was such that the opponent could not have checkmated the player’s king by any possible series of legal moves. Last edited by Kevin Bonham; 14-09-2018 at 11:15 AM. Yes it does take care of the illegal move situation. Unfortunately it doesn't take care of flag fall, and it would be difficult to make a similar solution for flag fall. The other problem is we still have "legal moves" meaning "moves complying with Article 3" and not "complying with the complete Laws of Chess". If any of you had claimed the illegal move, yes it takes care of it. If you had made a king move and expecting to now continue mating with your new queen(!) then I suppose the illegal move cannot be claimed because of "the illegal move shall stand". One of the most devious little articles in the Laws of Chess in my opinion. Let chaos reign. The other problem is we still have "legal moves" meaning "moves complying with Article 3" and not "complying with the complete Laws of Chess". I think that's what "legal moves" should mean. Unfortunately we've had this trend of treating a bunch of what used to be illegal actions as "illegal moves" in order to subject them to the same punishment so the concept has become blurred. Perhaps more illegal actions (such as pressing the clock without rectifying knocked-over pieces) will become "illegal moves" in future. If you had made a king move and expecting to now continue mating with your new queen(!) then I suppose the illegal move cannot be claimed because of "the illegal move shall stand". One of the most devious little articles in the Laws of Chess in my opinion. Let chaos reign. I could have also picked up the new queen and started moving it right away. What I did was point out to my opponent what he had done and offer him a draw, which he was in no position to refuse. Yes you could have. Really I don't see any moral problem or sportsmanship problem if you will, of utilizing his mistake (promote to queen of wrong colour) as any other mistake OTB. I don't see it as bad sportsmanship. You would also claim if he used too much time and lost on time. When I suggested you move your king first, it is because an arbiter that was very nasty could say you made an illegal move with the queen (even though the queen is your colour) and declare the game a loss for you. Using a king move to assure "illegal move shall stand" is the safer option ... he would be wrong though. The Chess Federation of France publish its Arbiters' Examinations with correct answers after each exam sessions. The entire Federation disagree with you as showed by this question number 5 from the December 2017 examination (befre the latest changes). The question had 4 parts, in all cases, White flag falls after he has touched a piece. White touches his King: Answer White loose on time, he could have played Kf1 or Kf2. 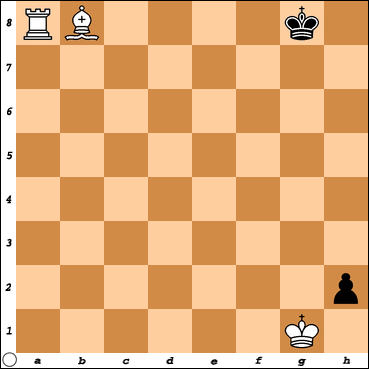 White touches his bishop: Answer Draw, the bishop must capture on h2 and Black can no longer mate. White touches his rook: Answer White loose on time. White touches the h2 pawn: Answer Draw, White must capture the pawn and Black no longer have any mating material. The sole justification given for those answers is Article 6.9 Except where one of Articles 5.1.1, 5.1.2, 5.2.1, 5.2.2, 5.2.3 applies, if a player does not complete the prescribed number of moves in the allotted time, the game is lost by that player. However, the game is drawn if the position is such that the opponent cannot checkmate the player’s king by any possible series of legal moves. They consider that touching a piece limits the series of legal moves. Last edited by Pierre Dénommée; 08-10-2018 at 10:05 AM. I think I'll ask the Rules Commission to discuss and resolve this at the 2019 or 2020 Congress (not necessarily by changing the Laws but at least by giving an interpretation). I didn't ask them at the 2018 Congress as that was the cycle in which they deal with what will be called the General Regulations for Competitions (currently Competition Rules).